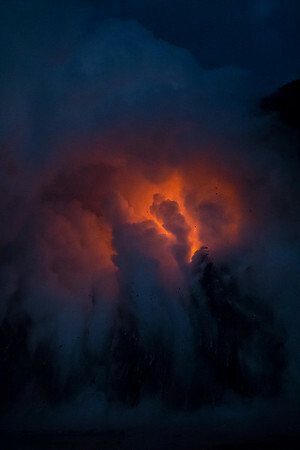 The glow of molten lava is seen through the steam cloud formed as it enters the sea. This image is of lava flow 61G at Kamokuna on the southeast flank of Kilauea. This image was captured on February 2, 2017. This specific event has become known as the "Firehose" flow and was created when a 26 acre section of the bench collapsed into the sea on December 31, 2016. This flow was accessed by boat and documents the explosive reaction of molten lava with seawater.